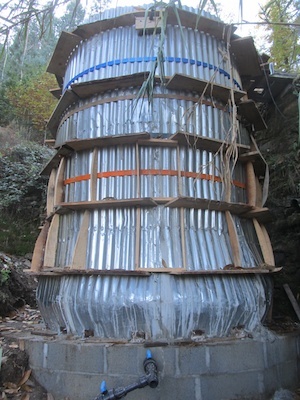 Among many other projects on the go simultaneously last summer was the installation of some water storage capacity and supply lines to the various buildings on the quinta. The design and layout gives a good head of gravity-fed water to all parts of the quinta, and provides buffering for the vagaries of daily stream flow in late summer. 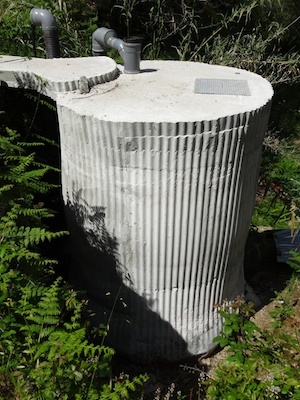 The two tanks constructed from pre-cast concrete rings were fairly quick to construct. Finishing them proved more of a problem. 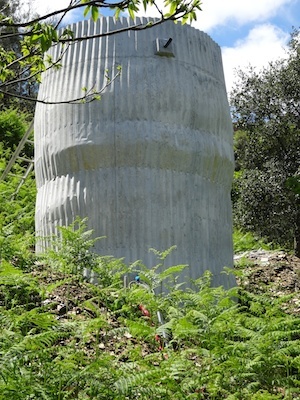 In the UK, it’s possible to hire the formwork for casting the concrete jackets around the outside of the concrete rings once they’re in place. Not so in Portugal. (Or at least if it is, nobody we asked in the building trade knew anything about it.) With nothing readily available for the job, we improvised our own out of corrugated roofing sheets and wooden supporting ribs, overlapped and bolted together. Wet concrete is pretty heavy and the corrugated metal wasn’t really up to the job. 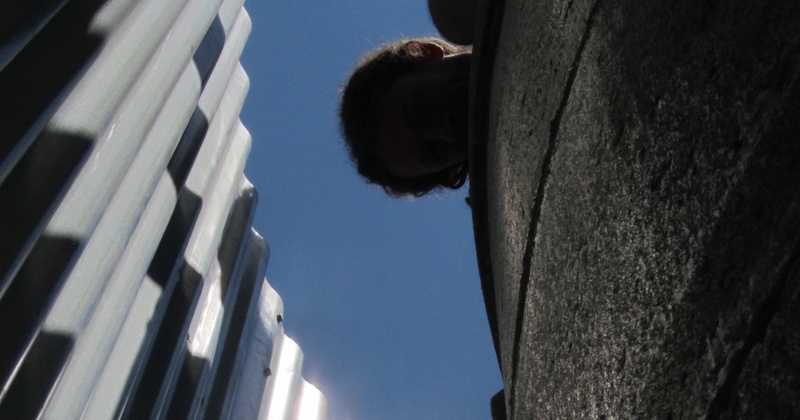 There was some interesting sagging and we ended up using a lot more concrete than was strictly necessary. But the end result thankfully is that the tanks are fit for purpose, even if rather interesting shapes. 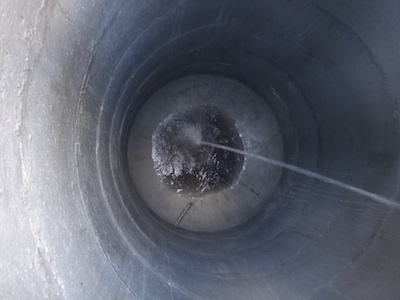 The hub of the system, the 12,000-litre ‘frilly tulip’, with and without its jacket. Ditto for the 6,000-litre ‘drunken cupcake’ serving the east side of the quinta. The frilly tulip is fed from a pick-up in the stream made out of a length of slotted drainage channel in high density plastic (the sort which is installed to remove surface runoff from paved areas). 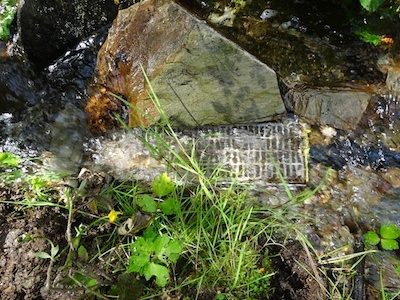 This is covered with a fine nylon mesh which filters out most of the stream-borne stones and debris. In two months of continuous operation, I’ve only had to clean the filter once, and that was because the javali had come down to the stream and made a mud wallow right next to it! 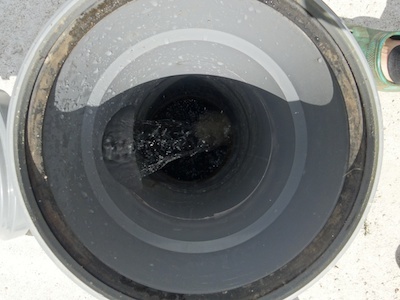 This leaves only the finer silt to settle out into a 4m flushable U-bend before entering the tank. I did originally plan to have a further filter at the tank entry point, but the rate of flow just wasn’t compatible with that idea. The moment we’d been waiting for! February 27th and the main 12,000-litre tank begins to fill. It took just 3 hours. The tank is fed continually, with excess supply simply exiting the overflow and straight back into the lower branch of the stream as it runs through the terraces. 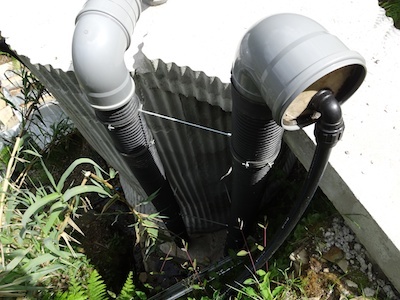 In addition to creating a water supply for the main building, wee house and bathroom, we’ve also buried supply pipe all over the quinta with a total of 18 (and counting) taps with push-fit connections for hosepipes. The general idea is that nowhere on the quinta will be any further than 25m (the length of a reasonably manageable coil of hosepipe) from the nearest tap. 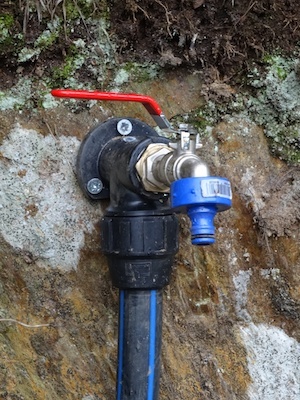 This means that for the first time we will be able to irrigate everywhere on the quinta! 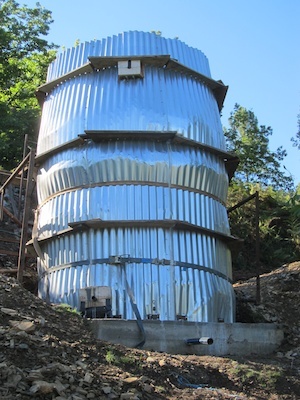 Connecting the water supply to the wee house has also meant that we could finally commission the worm-composting flush toilet as well as start to use the outside kitchen.